Built in 1781, this palace is the place where Napoleon signed the Peace Treaty after the Battle of Austerlitz. Today the larger-than-life palace is a treat not just for the victorious memories of Bratislava but also its deep rooted art, architecture and craftsmanship. 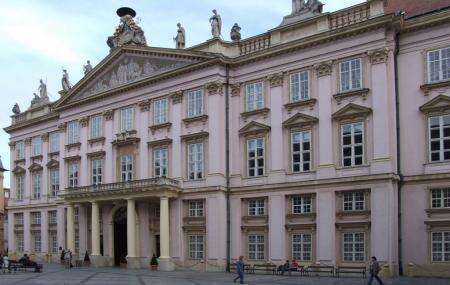 Since 1903, the Palace serves as a City Hall and many concerts are held here. However, the highlight is the Gallery museum which showcases a fine collection of English Tapestries, breath-taking facades, sculptures and the grand fountain of St George (the legend who fought a Dragon). For more prices call up the place or visit the official website. How popular is Primates' Palace? People normally club together Bratislava City Museum and Galeria Nedbalka while planning their visit to Primates' Palace. The primates palace in the centre of the city is a must see for any visitor. It's a beautiful building from the outside and easy to find. Entry is very reasonable and students can get a discount. Lots of interesting rooms and information on its history is readily available. I would recommend not missing out on the view of the chapel from above at the end and the hall of mirrors. One of the most visited sights in the city. Watch out for opening hours. Definitely worths a visit. Beautiful building worth a photo or two with some beautiful courtyards. Weird name though, right?